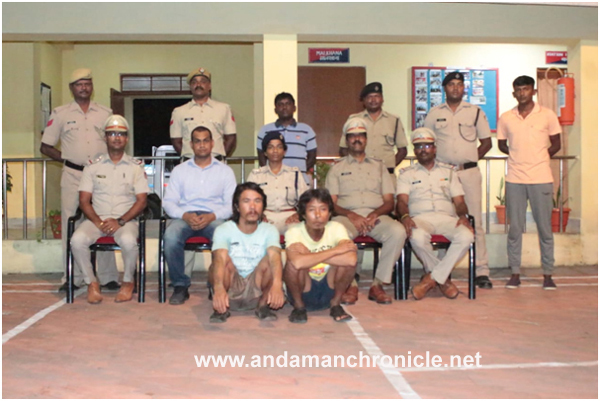 Port Blair, April 18: The Police personnel of PS Katchal apprehended two Burmese/ Myanmarese poachers based on local intelligence from jungle of West Bay, Katchal in the intervening night of 14th – 15th April, 2019. These Myanmarese nationals were malnourished, exhausted and weak when they were apprehended. They were immediately provided medical aid. On interrogation, they revealed that they were also part of the same gang of poachers that was arrested in October, 2018. They further revealed that during last 05 months, they did not make any human contact and basically survived on coconut, rainwater and dried molluscs. Both the poachers have been arrested under relevant section of law and being produced in front of the Hon’ble Court. Local police under the leadership of ASP Car Nicobar, Ms Sandhya Swamy, IPS and Dy.SP Shri Jagdev Singh Yadav, DANIPS have also launched a massive search and combing operation in Katchal island to sanitize the area from any more hidden poachers.